Between catching an episode of Life Below Zero and Heartland, I managed to take a few moments to see how I could save some money on my streaming services this past week. 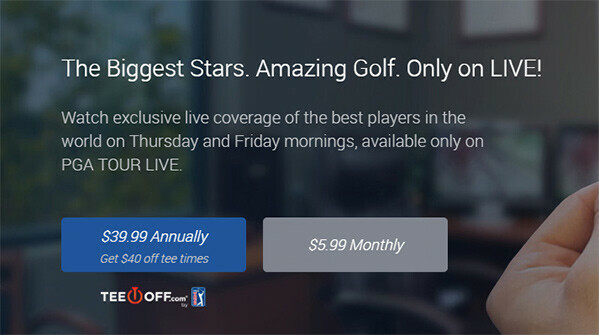 After cutting the cord a few years ago, the Mrs and I have Amazon Prime, Hulu and Neflix (and I subscribed to the PGA Tour LIVE a year ago to appease my golf itch). Except for the lady (who loves a lot of NBC shows), I primarily use Netflix and don’t find myself venturing into the Amazon or Hulu. Amazon Prime $ 8.25 approx. While I think we could get rid of Prime and Hulu down the road, I don’t think that spending $30/mo on entertainment is terrible. We don’t go out a lot – and to be honest – I can’t remember the last time we went to the theater OR out to eat together. It’s not that we’re cheapskates or I’m an unromantic knob, but we have found that in-home move-watching is just as fun – and our food, just as good (if not better) than we can get elsewhere. I still eat out at least 1x during the work week (usually Qdoba). Back to the issue at hand: saving on those streaming services. I took a look at our accounts for each service we are subscribed to, and found a few ways that I could save a little more each month. Also, some other ways I thought I’d share here. Feel free to offer your own ways to save in the comments section. After logging on to our Netflix account, I noticed something that struck me as odd. I don’t know if its me and my forgetfulness or our friends at Netflix, but we seem to have been signed up for a plan we didn’t need. This brings me to my first suggestion: know thy plan. Hulu and Netflix offer several options: 2 and 3 respectively. With our Netflix account, we were on the $9.99/mo option that allows you to use it on 2 screens at the same time. Since we don’t typically watch at the same time, I moved us down to the 1 screen plan at $7.99/mo. 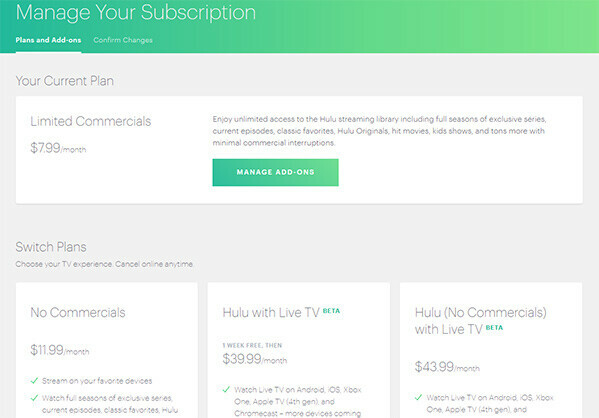 And, taking a look at Hulu’s plans, they essentially have two options. Commercials (which we are on) or no commercials. To save $4/mo, I don’t mind putting up with a few ads. They also have live TV options, which we’ll try and take a look at, at a later date (YouTube is also getting into this game). Most websites today have a chat feature where you can get support. It doesn’t take a lot of time – and often – you can get better, faster service than if you got on the horn. Try this too – most seem agreeable to offering at least a month free or another discount for your loyalty. I’d recommend you only attempt this 1-2x a year. I’ve detailed my conversations on saving money by using loyalty. Essentially, you can now add another adult to the plan as well as four children. I believe you could share your membership with 4 others (even if they were outside your household) previously. I’m real hip on referral bonuses. Free money / goods just for recommending a service / product that you love. Not a bad way to go about saving money. 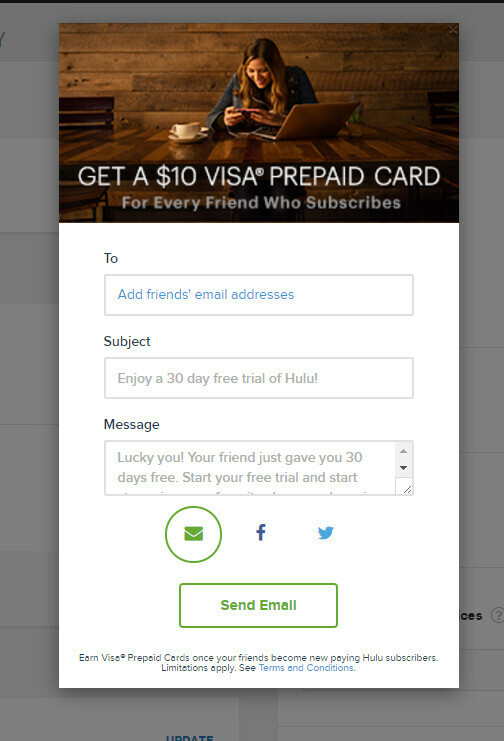 Hulu offers a referral bonus for each person that you get to sign-up. This is basically one-month free and all you can easily use their callout found in the dashboard to try and onboard your contact. 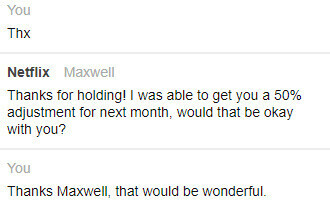 Netflix had a referral program which they have since discontinued. And with Amazon, you’d need to become an Associate member to earn affiliate rewards. If you’re planning to use the service for awhile, why not pay it all upfront? This is what I do with PGA Tour LIVE. For $40/year, I save $32 over their monthy rate of $6/mo or $72/year. That’s significant and I wish the other streaming services enticed members with a similar offer. It’s often cheaper to pay upfront for your streaming service. When discounted gift cards came out – it seemed like we could get major savings on all sorts of products / services we frequented. But it seems like the savings by discounted gift cards are becoming harder to find. That said, last year I bought a Hulu gift card that essentially got me a month and a half off. I typically check out discounted gift card aggregators like GiftCardGranny.com to see what is out there. What ways have you found to save on streaming? I’ve used the trick in the past to cut our Netflix down to one stream at a time, to save $24 a year. We usually only watch on one screen at a time anyway, like you said. That said, I’ve found in the past that we typically sign up for too many services at once – having Hulu, Netflix and Prime all at once. I’ve found that it was a better use of our money to alternate services – being signed up for Netflix for a while until you’ve watched a lot of the shows you want with that service, and then switching to another that has different shows/movies/etc. So instead of paying for both, paying for one at a time. We currently pay for Playstation Vue as our main TV content provider for $34.99/month, along with Amazon Prime – and an antenna TV DVR. That seems to give us more than we need honestly. If it weren’t for the fact that my wife enjoys several shows on cable TV that we can’t get elsewhere, we’d probably cancel Vue as well and do mainly prime and antenna. Love the tip about buying gift cards to get cheaper service, may have to use that one! Smart idea about switching services / using them up after viewing all the shows you want. Thanks Peter! Whoa – that seems like a lot. Here’s DirecTV’s customer service number if you need to get a hold of them again, it is: 1-855-387-6898. Charlie’s used DirecTV for some time. I just checked my Netflix and saw that I’ve been paying for 2 screens also–only need one now, so changed it. Thanks for the tip. $2 a month adds up over time! Glad you were able to see some savings! Is there a noticeable difference in the Standard Definition Plan that you downgraded to? I have an older 1080p LCD TV, so I’m not sure I’ll notice much of a difference, but wanted to see if you’ve noticed. Hey Badier – I haven’t noticed anything yet. But, our TV is a small one at 19″ and similar to yours. I don’t know about similar, I have a 46″ TV! I just spoke to a friend who works at Netflix, and that plan is geared more toward folks with small TV’s, those who live in rural areas, and folks watching on mobile. Doesn’t sound like me at all. Good to know Badier! Thanks for letting us know about this. I’ll bet you would! ;) I’d love to hear if you try it and it works for ya. I like your tips, especially the loyalty discount. I find that often you just have to ask to receive a little break. A quick note about discount gift cards – I bought a couple fandango cards from GiftCardGranny.com a while ago only to find out that when I went to redeem them, they were duds. Lost a cool twenty bucks…. When I contacted GCG.com they said it was an inherent risk since the cards are sold by individuals who aren’t vetted. I have noticed you recommend them a bit – you may want to qualify the recommendation with the potential risks. Thanks for the note Alexandra. Appreciate the heads up regarding GiftCardGranny.com. They have new ownership within the past year or so, and I’m not real excited about what they’ve done with the site (why I don’t link out to them). Also, note they are just an aggregator – so they don’t typically vet their vendors (although they should). Best to you. Oh yeah, you’d be shocked at how much money you can save just by asking for discounts. You can also sign up for these services through cashback portals (I use Acorns) to earn a little extra money for something you were signing up for anyway. Haven’t heard of Acorns – will hafta check-out. Nice, I need to update our Netflix plan. We only watch on one screen. On the other hand, there’s nothing against the law that would prevent me from sharing my Netflix account with someone else, so maybe I could bump up to the 4-screen plan and split the cost with some friends/family. :) With the ability to create individual profiles now, this seems like it’d actually work out pretty nicely. Their viewing habits wouldn’t change anything. Good point Dave – believe as long as you stick to under 4 screens, you’re good to go with sharing Netflix acct. Know there was rumors around w/ folks getting prosecuted for sharing – but this is false.